This dog is famous in England for its use in fox hunting packs. It is believed this well known breed was developed from the Saint Hubert Hound (looks similar to a bloodhound) and arrived in the UK during the Norman invasion. The St Hubert Hound was first developed in the Ardennes Abbey in Switzerland. 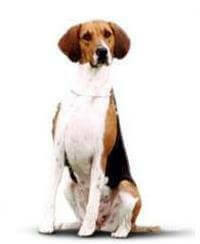 The Average lifespan of a Foxhound is 12 years but, with good care and nutrition, can live up to 14 years of age. The ideal height for the female is 58cm and should weigh up to 25kg, while the male is normally 69cm and weighs up to 34kg. Active, friendly, and extremely alert, these dogs make very affectionate pets. Even in the pack environment they are always friendly to humans and tend to greet each person with a wagging tail. Although bred to live as part of a pack, these loving animals do make affectionate house pets and will get on well with any other animals in the home. Being short coated they are easy to keep clean using either a hand-grooming glove or a leather to remove any dirt from the coat. They need exercise, but in the house will be happy to just 'hang out' without fuss. They do however possess a very powerful roaming instinct so training them to come when called is a priority from an early age. The Foxhound is an ideal companion for those wanting the challenge of training a smart and willing companion. These happy dogs will fit in with people in most situations so long as they are given plenty of love and affection. These dogs will be happiest when given a sizeable backyard to explore and taken for a good walk every couple of days.